We've got the answers to all your questions - and some you'd never think to ask. If you have a question that isn't listed, please feel free to contact support using any of the methods listed to the right. 1. What are the system requirements to run AgencyIntelligence? 2. I am a new agent. Can I use AgencyIntelligence just for myself? Yes, AgencyIntelligence is fully scalable from one user to thousands of users. As a single user, you will have administrator access. As your agency grows, you can add multiple access profiles to your account. 3. Are there any long term contracts? AgencyIntelligence features a flexible, 6 month subscription plan. Accounts will be billed on a monthly basis. 4. What phone system can I use with the lead system? AgencyIntelligence is compatible with Skype as well as many SIP based phone systems such as Bria 4. For more information, contact us. 5. Is there a way to import my existing book of business into AgencyIntelligence? Yes, AgencyIntelligence allows you to import your current clients and policies making the migration to our system seamless. 6. How do I keep track of my documents that I receive from clients and vendors? 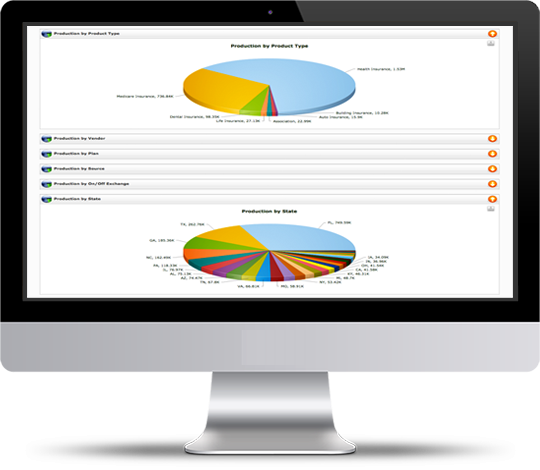 AgencyIntelligence allows you to digitally attach any document to a lead, client and policy. You can also attach licensing, E&O and vendor documents into the system. 7. How do I get my leads into AgencyIntelligence? There are 3 different ways to import leads into AgencyIntelligence. You can do a bulk lead import, manually add them or do a real-time post. Request a live demo to see this in action. 8. How do I download AgencyIntelligence? AgencyIntelligence is a cloud based solution for insurance agencies, so there is no need to download any software to your computer. You can access AgencyIntelligence anytime and anywhere you have a high speed internet connection. 9. Does AgencyIntelligence allow agents to split commissions? Yes, AgencyIntelligence allows you to split commissions on a percentage basis. Commissioning rules allow the agency to split commissions across hierarchy levels. 10. Is there a way for AgencyIntelligence to know what licenses I hold? Yes, AgencyIntelligence has the capability to keep all of your licenses electronically on file. In addition, the system implements rules to only allow you to sell in states you are licensed in. 11. I own a call center with 10 agents. How do I allow my agents access to my leads? Call campaigns can be setup to allow agents access to leads. Paramaters within the call campaign can be used to segregate leads by state, type, source, etc. 12. How can I see if one of my agents is being productive? You can pull a production report with criteria ranging from all agents, to a single agent with an individual plan within a specified date range. Get support by phone, email, chat, or submit a new ticket.